This is what the angels told the women who came to the tomb to put the burial spices on Jesus after the Passover had finished. What shocking news! This was what the angels told them…brought to their remembrance what Jesus had told them about Himself. So, let’s see what’s going on here. First, Jesus died in our stead. Now He’s risen. That’s proof that He was more than just a man. He was and IS God! God Incarnate! God in the Flesh! And…He did ALL of this for us! Now it’s in our lap. What do we do with this information? How do we deal with Someone who has done all of this for us? It’s very simple, really. We are the only ones who make it difficult. All we need to do is tell Him that we believe that what He did really did happen. Then accept His gift of forgiveness. That’s what all of this is, you know…a GIFT! We all know what to do with a gift, don’t we? We accept it! We say thank you! Well, this is the same thing, except this is the best gift you will ever receive. My question to you: Are you ready to accept this gift? Accept it today. He did all of this for you. He is waiting for you. Jesus is saying this to you today. He is standing at your heart’s door and knocking. Will you let Him in today? Just ask Him in and He will. He never lies. When He says He will come in, He will. He just needs your permission to enter. It is Finished. That is what Jesus said just before He took His last breath. But, what was finished, you ask? What was finished, was not His life, but what He was sent to this earth to do for us. He took upon Himself our sin. He sacrificed Himself for us! He died for us! It wasn’t easy for Him, either. He was God, yes, but He was also human. He had feelings just like we have feelings. The reason He lived a human life was to experience everything we experience. He knows what it feels like to be rejected. He knows what it’s like to be raised by parents. He knows the feelings of those you love to turn their backs on you. But, He was also God. He lived the perfect life. He was the sacrificial lamb…for us! Wow! So, let’s remember what He did for us. He took my sin upon Himself and died in my stead. No one else before Him or after Him could have done that…not even my parents. He loves me unconditionally. Let us offer the sacrifice of praise unto God CONTINUALLY! Continually means all the time. Yes, there are times that you just plain don’t feel like it. But it doesn’t go by feelings. We praise Him because of Who He is and what He has done for us. What better reason than that? Yes, I know the devil, our adversary, tries to have us go by our feelings. “I just don’t feel like it right now”…even though you are in the worship service at church. Everyone else is doing it, but you don’t feel like it. The cares of your life weigh upon you. That’s where the sacrifice of praise comes in. And you know…God seems to cherish those moments more than when you feel like it. You are sacrificing to thank Him for Who He is. He loves it! And when you do, be ready to be showered in love…His Love. 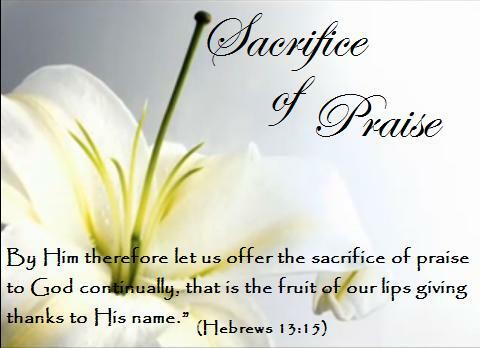 So, my challenge to you today, is to sacrifice praise unto God. Try it! This is the day the Lord has made…I WILL rejoice and be glad in it! This is my prayer every m orning. What better way than to wake up in the morning and acknowledge that He has made that day that you are about to enter? Let Him be prominant in it! Let Him lead you! This is His day! Live it for Him. This was an awesome book. I really started this about 4 months ago, though. It took awhile because I more studied it than just read it. It brought me to a conviction throughout the book. I have a hunger to do the fasting. 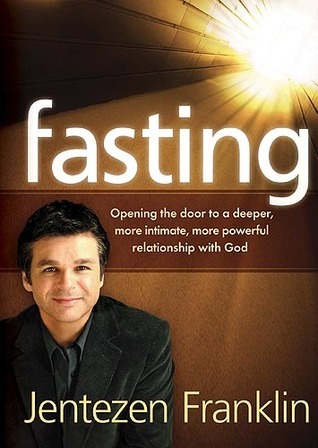 The corporate fasting that Jentezen Franklin’s church does brings even more power. You also realize that if you start your year out with fasting, it just seems to bless the whole year! This is a teaching book, but many testimonials inside. This is a MUST read! But, if you are not willing to fast, it won’t be worth taking the time going through this. I was prompted by the Holy Spirit to go through this book. I am not ready to do a complete fast, but I can do a Daniel fast. There are three different fasts, and timings, too. But, you will have to read the book to find out what they are! But, if you want the power of the Holy Spirit in your life and want to be blessed by God, read this. It takes three aspects…just as in the Trinity you have Father/Son/Holy Spirit; you are spirit/soul/body; this is fasting/prayer/giving. To me, it seems as if God works in threes. Well, you will have to read the book to find out any more. Enjoy reading! How big is your God? That is the question we are asking today. You know, He made the whole universe. Now, how big is the universe? There is estimated to be between 100-200 billion galaxies in the universe. Each with billions of stars. We are of the Milky Way solar system with 200-400 billion stars. That’s pretty vast, isn’t it? Mind-boggling. What comes to my mind is the song, ‘He’s Got the Whole World in His Hands’. Wow! Have you ever imagined that? The WHOLE World! That’s mighty Big, if you ask me. But, even though He’s got the whole world in His hands, He still care for me…and you! So, what are you in need of today? Healing? Finances? Employment? Encouragement? How Big is Your God? Is He big enough to take care of those problems? Pray for the peace of Jerusalem. Do we do this? If we did, things would be much different. For, if we did, we would be blessed. For as God said in Genesis, he would bless those that blessed Jerusalem. We need to begin to do this, and the beginning of this is to pray for her.